No one falls in love with a nature. We fall in love with a person. A woman loves a man, not mankind. And a mother pinches the pudgy little cheeks of a newborn baby, not the cheeks of a newborn nature. Saint Mary gave birth to a little person, a baby, unlike any other. In that little person, a human nature united with a divine nature at the moment of conception. 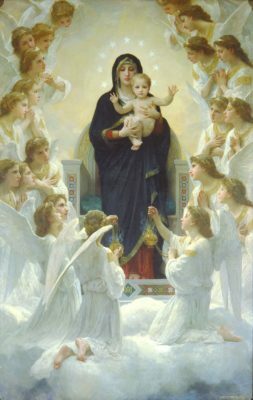 So Mary was the mother of the person Jesus, and the person Jesus had two natures, one fully human and the other fully divine. Saint Mary was, then, the mother of Jesus’ human nature and of His divine nature. She was both the mother of a man and the mother of God. Two false extremes must be identified and rejected here. Jesus was not really and truly only a God who just faked being a man. Nor was He really a man who just pretended to be a God. Jesus the man did not wear His divinity like a cloak that He could remove from His shoulders when He walked in the door. And the Son of God did not wear a fleshy human mask to conceal the radiance of His real divine face. Jesus was fully God and fully man in a mystery of faith we call the hypostatic union. And because a woman is a mother to a person, not a nature, Mary is the mother of God. This has been the constant doctrine of the Catholic Church since the Council of Ephesus in 431 A.D.
Saint Mary has many titles under which we honor her. Today’s Solemnity commemorates the utterly unique, and unrepeatable, bond she shared with Jesus, a bond no other saint can claim. Jesus and Mary probably even looked very much alike, as hers was the only human DNA in His body. What a beautiful thing that our God did not float down from heaven on a golden pillow. How good that He was not forged from a fiery anvil. How just that He did not ride to earth on a thunderbolt. Jesus could not redeem what He did not assume. So it was fitting that He was born like all of us—from a mom. We honor Mary today for her vocation as mother. If she had disappeared from the pages of the Gospels after giving birth to Jesus she still would have fulfilled her role in salvation history. She was obedient. She was generous. She allowed God to use her, body and soul, to write the first chapter of man’s true story, the story of the Church. Like all true stories, the person comes first. A life is lived. The book comes later. God’s Mother gives us our mother, Holy Mother Church, who washes our souls in the saving waters of baptism and thus adopts us into God’s family. The Motherhood of Mary gives the world Jesus. Jesus gives us the Church. The Church then brings us into God’s family where Mary is our mother, Jesus our brother, and God our Father. This is the family of the Church. What pride to be members of so noble a family! 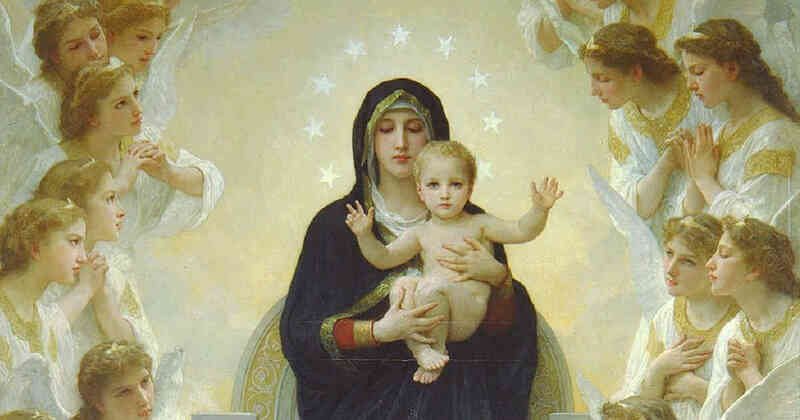 O Mother of God, you birthed the one who created all. How beautiful the mystery. How exalted your vocation that precedes and makes possible the Apostles’ own vocations. At home you bounced on your knee the one who spins the world on His finger. Help us start this new year with wonder more than resolutions, with eternal gratitude more than mundane goals. “Mary, the all-holy ever-virgin Mother of God, is the masterwork of the mission of the Son and the Spirit in the fullness of time. For the first time in the plan of salvation and because his Spirit had prepared her, the Father found the dwelling place where his Son and his Spirit could dwell among men. In this sense the Church’s Tradition has often read the most beautiful texts on wisdom in relation to Mary. Mary is acclaimed and represented in the liturgy as the “Seat of Wisdom.” In her, the “wonders of God” that the Spirit was to fulfill in Christ and the Church began to be manifested,” (CCC 721).